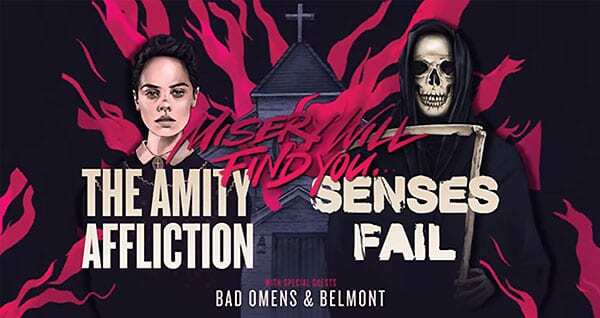 Bad Omens were due to perform on the co-headlining Amity Affliction and Senses Fail “Misery Will Find You Tour,” but due to the size of their name on the tour poster, they pulled out of the upcoming run. Many bands took to Amity Affliction and Senses Fail’s defense, noting that smaller bands typically have a smaller size font on a tour poster, since they are only an opening act. Following the announcements, Bad Omens released a statement on their Facebook page, noting that there was a deal in place to be the direct supporting act on the co-headlining tour, but the negotiations were not honored and they therefore felt the need to pull out of the tour. “Our team politely and professionally asked [the negotiations] to be honored before the tour was announced and they refused,” Bad Omens said in the statement. “Specific assets requested were neither sent or approved. After all of this and the tour still going live we did our best to remedy the situation to stay involved and we were met with total disrespect. The Amity Affliction and Senses Fail co-headlining tour will kick-off next January in Anaheim, California, making stops in cities like Baltimore, Detroit, Seattle, New York, and Sacramento. Los Angeles, California will close-out the trek on February 9. Check out the full list of tour dates below. 01/18 – Baltimore, MD @ Rams Head Live!